This post was sponsored by Kroger. All opinions expressed on my site are my own. 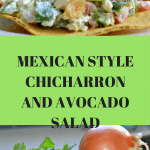 If you like Mexican food, then you are going to want to try this Mexican Style Chicharrón and Avocado salad. 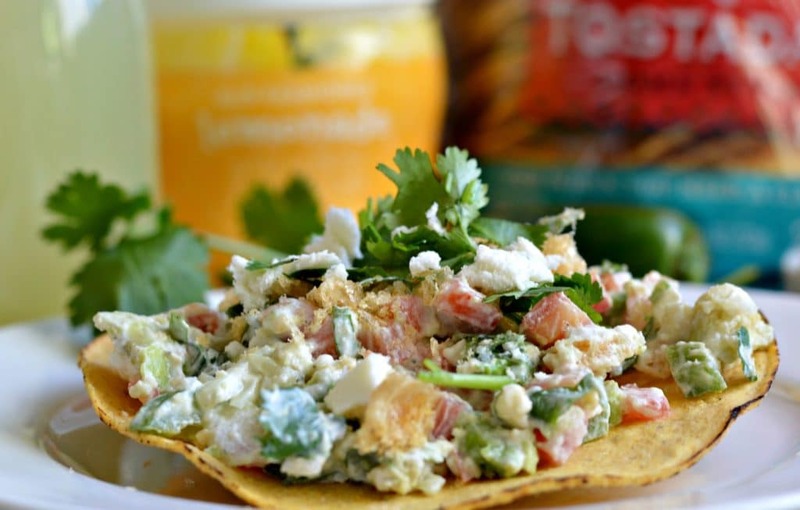 It combines fresh, salty, and spicy flavors together and tastes great on its own or on top of tostadas. Keep reading to find out how to make it. By just taking a quick look at my site, you will realize that I love sharing delicious recipes from Mexico. Even though I have been in the United States for 6 years and am in the process of becoming a citizen, I will always love Mexico and its amazing food. When most people think of Mexican food, they think of tacos, quesadillas, burritos and enchiladas. 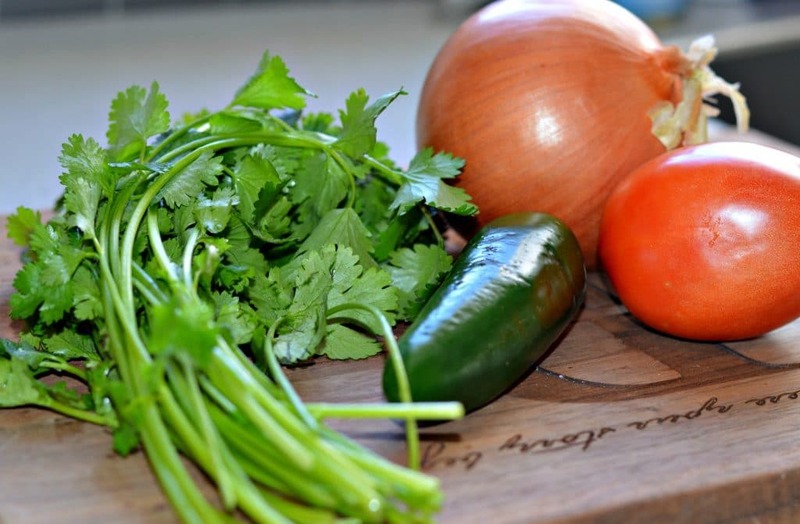 While those foods are pretty tasty, there is so much more to delicious Mexican cuisine. For example, the recipe that I want to share today is a delicious Mexican style salad that combines so many different flavors that are common in Mexican recipes. It has avocados, chicharrones (fried pork rinds), tomatoes, and more. One problem with making Mexican food here in the United States is that it can be difficult to find all of the correct ingredients. There are not very many Mexican markets where I live, so sometimes I have to settle for products that I wouldn’t normally use. For this recipe, however, I was able to find all of the ingredients at my local King Soopers (the Kroger affiliate here in Colorado). The great thing is that most of the products that I purchased were the Kroger brand, so not only were they more affordable than other brands, but I knew that I could trust their quality too! Sometimes I am hesitant to purchase store brand products, but that is never the case when I shop at King Soopers, and it made today’s recipe very affordable without sacrificing flavor. This recipe is so easy to make. 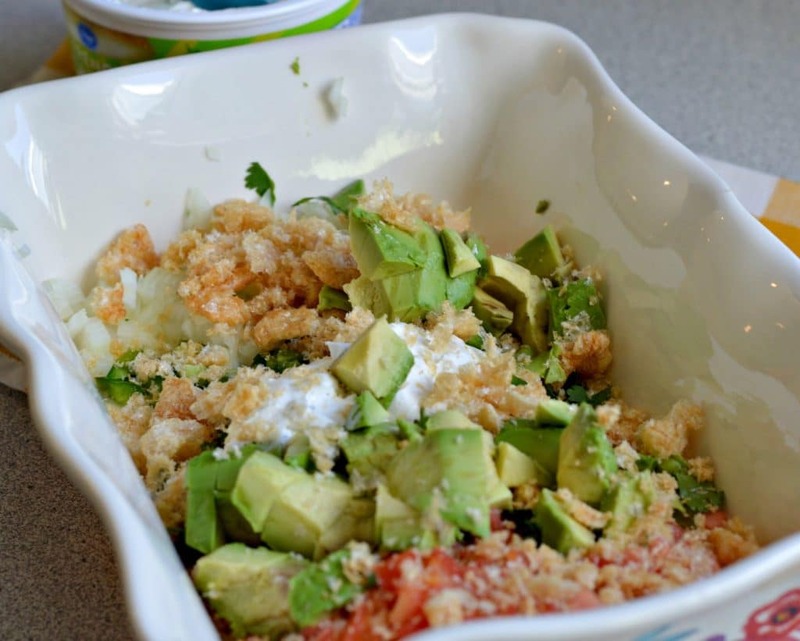 You start with a base of a classic pico de gallo, add avocado and french onion dip, and then add chopped up chicharrones and queso fresco. 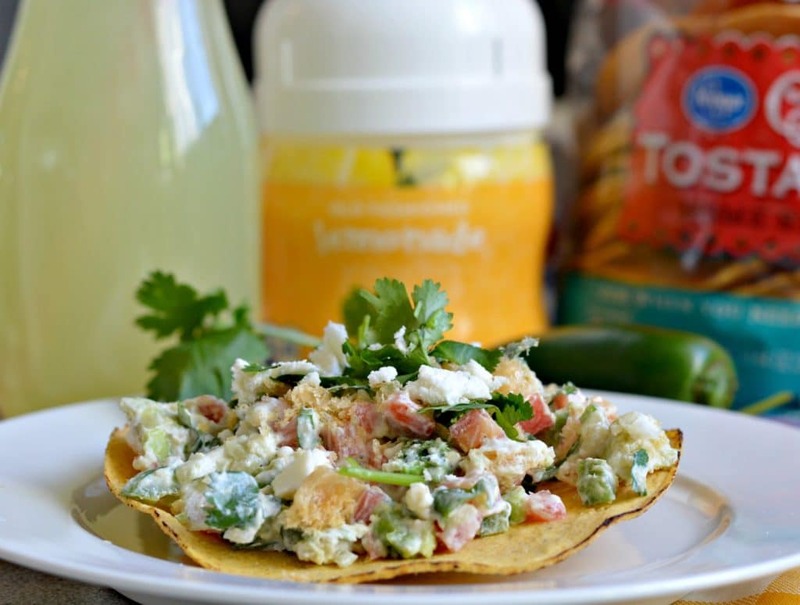 Mix it all together and serve on tostadas for a great salad tat you can eat while watching the game or for any other event. The end result is delicious and it goes great with cool glass of Kroger brand lemonade – so refreshing! I hope that you try this and enjoy it as much as I do. 1/2 bunch of cilantro chopped. 1-2 avocados pitted and chopped up. 1/4 bag of chicharrones pork rinds, roughly chopped. 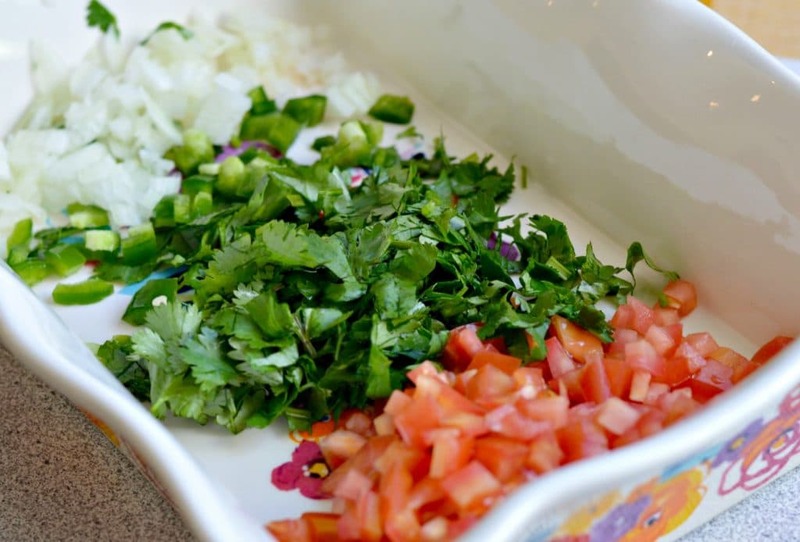 Add the tomato, cilantro, onion and jalapeno to a large dish. 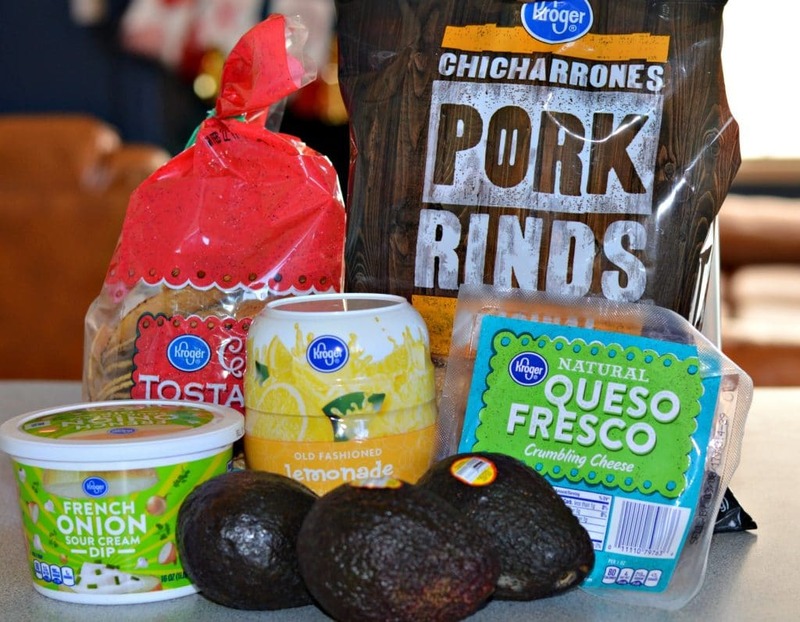 Add the avocados, french onion dip, and chicharrones. Add salt and pepper to taste and mix again. 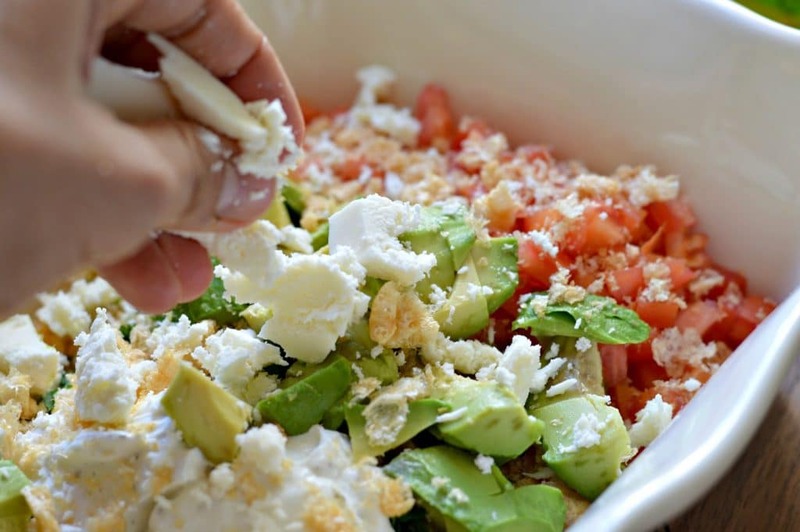 Crumble the queso fresco over the top. Serve alone or with tostadas. Fun recipe! I never thought of putting chicharrones in a salad. Thanks for the idea!